The Floveyor Tanker Loader is an agile, innovative response to increasing demand for efficient conveying solutions within the transport and bulk loading industries. The Tanker Loader is ideal for any application, including decanting and bulk loading of IBC’s, FIBC’s and containers into pneumatic & road tanker trucks for transport. This robust and portable Tanker Loader is equipped with an F5 Aero-mechanical Conveyor, capable of conveying any combination of powders and granules. Its mobility and low maintenance operating system perfectly match the needs of the logistics and materials handling industry, providing throughputs and efficiency second to none. 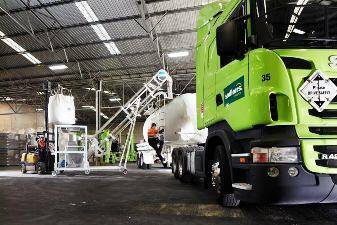 Its trademark Floveyor versatility means the Tanker Loader can be configured to suit many specific needs including: fully integrated dust extraction, hazardous zone compliance, and automatic fill control. Although to date, Floveyor has only soft launched the Tanker Loader range, it is already is in high demand across many sectors including mining, plastics, general manufacturing, and throughout the food industry. Floveyor’s Chief Executive Officer Rhys Walker attributes the unheralded popularity of his company’s latest small but mighty conveyor to ‘word of mouth’ marketing based on the Floveyor’s proven capacity for reliable high performance wherever it finds itself.